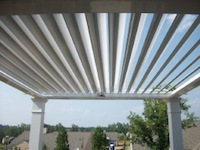 The greatest thing about our system is it is simple to use and you have complete control over the amount of shade or sun. Please observe the pictures below to see how it works. Raining, too much sun, want to cool off? Simply adjust the system with your remote to the closed position and you are protected from the elements. With our system you can angle it 25, 60, 80 degrees or whatever is comfortable for you. You have the freedom to let in the sun or keep out the rain! Want to layout and enjoy the rays? Switch your system to open mode and now you are enjoying the full sun. 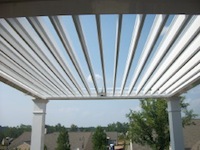 Just like a pergola or other patio system but you have control if the rain clouds come around. 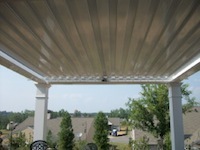 Continue to extend the system and control the shade. What is your setting? 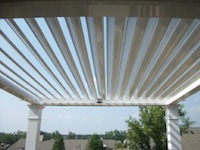 Keep your Adjustable Patio Cover at whatever position that best suits your needs. Our system allows for complete control. Have one of our associates visit your home today and show you the complete control of our system.